SUNDAYS VS. MONDAYS--WHAT DO YOU THINK? 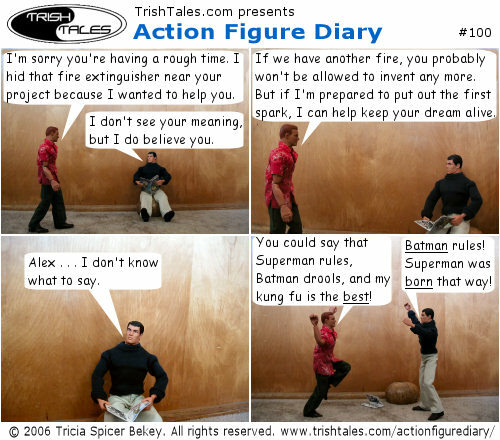 I'm thinking about switching Action Figure Diary's schedule from once a week sometime on Sundays to once a week on Monday mornings. Switching to Mondays should give me a boost in traffic, because my comic would be fresher on the comic feeds and directories when surf on Monday mornings. (Monday mornings are big on traffic for all my sites.) Switching to Mondays should also help me be more consistent about what time I post. If you have an opinion about Sunday postings vs. Monday postings, please let me know. Brothers gotta look out for brothers! I like Alex jumping up in the air. Your character development is most appreciated. Thanks for the comments! This project is SO fun to write. To keep Alex from falling over, I suspended him with a fishing line that's pinned to an overhanging counter. I was going for that Karate Kid finishing move (crane kick? ).